Get ready for an art show! When jewellery designers are going to participate in a show the first time, they often have a question about how to use the space in the most effective way. It is good if you can use glass show cases and special stands. Though, sometimes it is difficult to do if the space is expensive and you need to fit everything in a small space. Also, glass show cases them selves maybe expensive or an artist does not want to deal with heavy equipment. 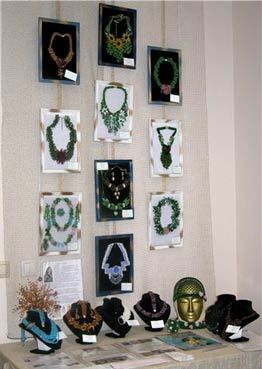 Irina Belinskaya went further and started to use deeper and bigger frames (65*45*50 cm) with glass to showcase a few pieces of her beaded jewellery. In this case she does not need to look after her works as they are locked in. Keep all your frames of the same size and it will be easy to store them in piles or you may hang them around your house. Other materials can be used as “frames”. I liked an idea of using a piece of wood with bark left on its sides. The surface is polished. 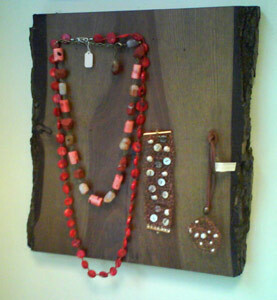 Put little nails into such piece of wood and use them to attach your jewellery. 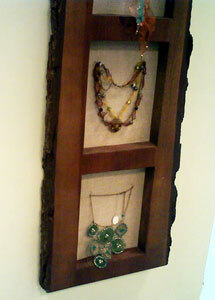 Such pieces of natural wood maybe used to make this stylish frame. 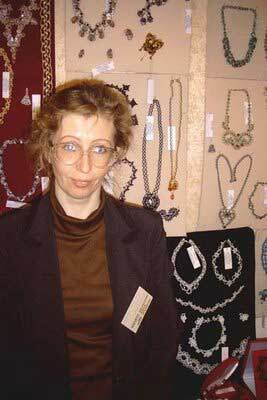 If you are going to a craft fair, you may use Rina Stepnaya's idea. She uses plane-tables that she makes of cardboard or thing foam plastic or even some kinds of pads. She covers her plane-tables with fabric (mostly velvet) and attaches loops on another side. You may show case many of your works on such plane-tables. Keep them of the same size and use boxes where they can fit easily. If you leave your jewellery on the plane-tables, you will be ready for the next show in 5 minutes!